I don't know how to make a lot of soups...but this one I can now make from memory. We eat this soup all the time (and we live in a warm climate...it's THAT good and easy). First let me give you the recipe and then my take on the recipe. Brown ground beef and drain. Set aside for later use. Drain corn and hominy. In 5 quart pan combine all ingredients. Simmer soup mixture for approximately 1 hour. Add any of the following for garnish; avocado wedges, sour cream, grated cheese, tortilla chips. Add more taco seasoning if you desire a more spicy mixture. Makes 8 generous servings. The recipe calls for water but I usually use chicken stock...use whatever suits your fancy! When I don't have taco seasoning on hand I use a teaspoon of cumin and red pepper flakes and a tablespoon of chili powder. 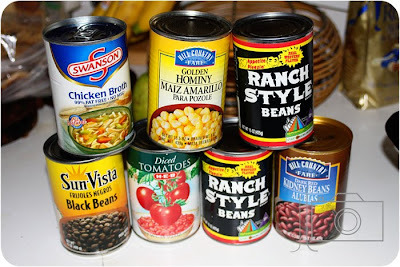 You could obviously use whatever beans you have on hand. 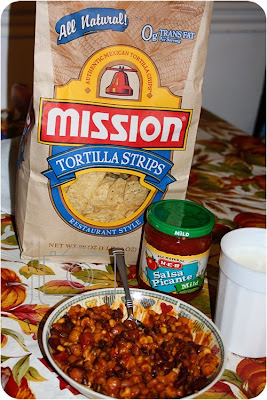 We top this soup with shredded cheese and sour cream, and eat it with our favorite Mission Chips! 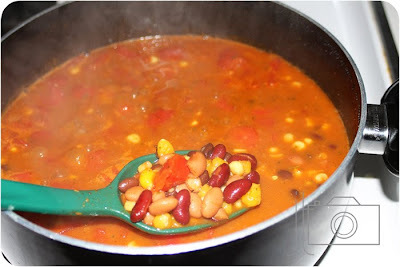 My kiddos love this soup and as long as I don't make it too spicy they usually ask for more. My daughter has been known to pretend to make this for her babies! I just took it to a friend who recently had a baby and she told me it was the best taco soup she'd ever had! Wow that looks good..Im saving this one..and pretty healthy too..Thanks..! This looks so yummy! I can't wait to try this recipe. Thanks Jamie.